There are at least three disciplinary views associated to enterprises and markets: the economic view, the management view, and the information systems view. Thinking of each of them as representations of a particular complex system has been a historical endeavor, which evolved through several distinct theories, models, approaches, and dimensions. To think about these three disciplinary views, collectively, is, however, a subject matter that is unusual by nature, and is related to a specific and complex area of knowledge: the field of interdisciplinary studies. Therefore, this chapter is organized in order to introduce two novel and innovative models and methodologies—the AID (Analyticsize-Integrate-Decide) Model and the AGG (Architecture-Governance-Growth) Model (which is the core reason of this book)—to help academics and professionals to deal with the interdisciplinary context of combining the economic view, the management view, and the information systems view (characterized here as a unified view) of the enterprise in the digital age. As already stated in the previous chapters, the modern economy is a complex system. 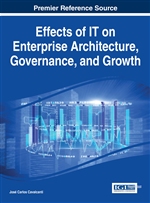 When one sees the modern enterprise through the lens of the three fields of knowledge dealt here in this book individually (the economic view, the management view, and the information systems view), it seems that such a complexity accelerates. However, when these three views are treated as a collective, the scenery turns out to be a different one. As pointed out by Newell (2001), the phenomena modeled by most complex systems are multi-faceted. Seen from one angle, they appear different than they do from another angle, because viewers see facets (represented as sub-systems) where different components and relationships dominate. Newell (2001) argues that like the phenomena modeled by all systems, their overall pattern of behavior is self-organizing, thus different from the sum of its parts and not fully predictable from them. Because the various facets are connected by nonlinear relationships, the overall pattern of behavior of the phenomenon (and thus the system) is not only self-organizing but also complex. As such, the pattern is only quasi-stable, partly predictable, and dynamic.